Storm is near its prime strength now. 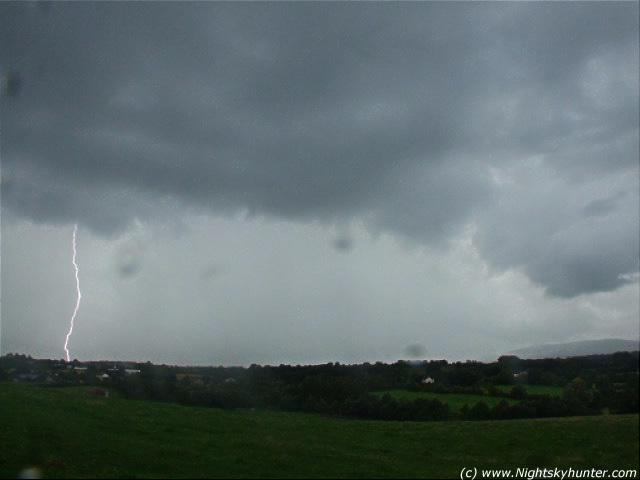 The precipitation core under this thing was unbelievable, it looks like a huge cylindrical waterfall with lightning. 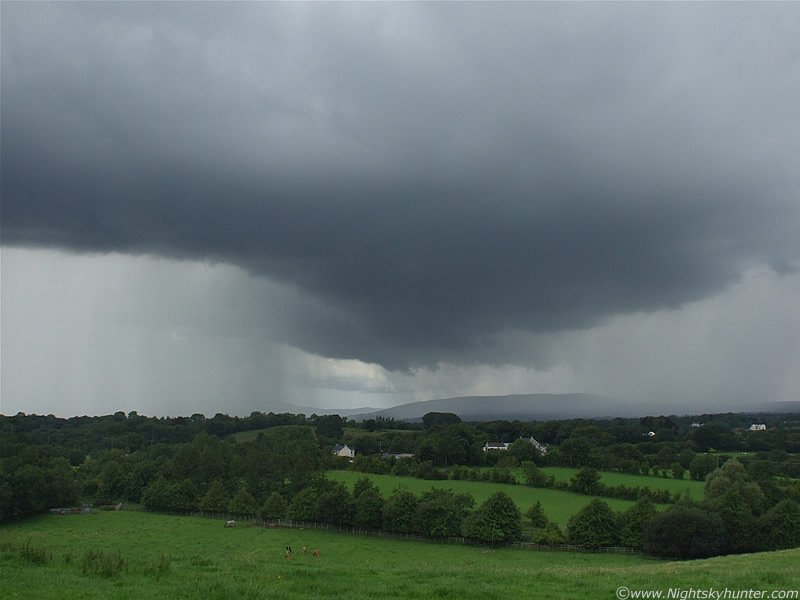 The entire storm is creeping at a snails pace to the L. From watching its movement it seemed to form over the W Sperrins on high ground, moved to the SE, formed three funnels, then moved down the mountain over the Glen Shane area and onto the lower ground of the Sperrins. 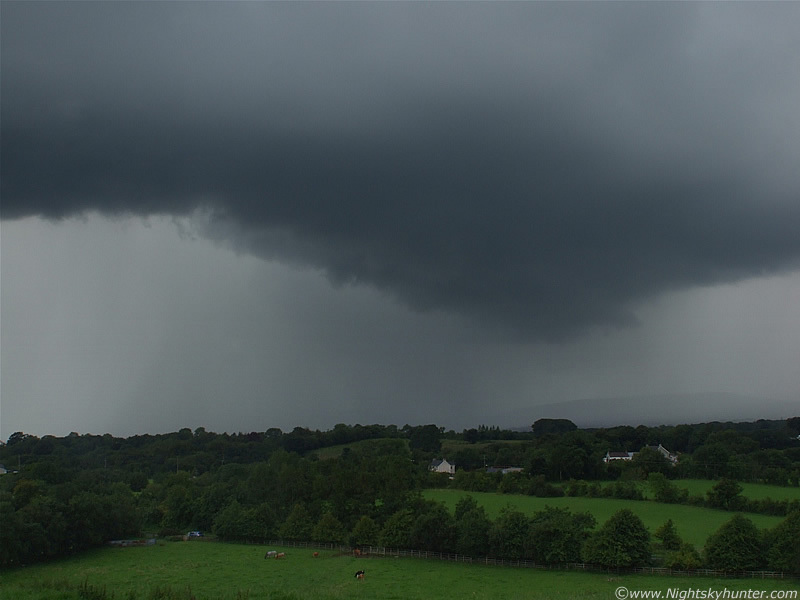 It's now over Maghera. The structure under the rim of the gust front to the L was really cool sporting a dark blue colour with subtle pink-red undulations. The storm looks a little like a spaceship here. This is the N section with two huge precip cores. Both of these cores had great looking c-g bolts striking the ground inside. I decided that I was not going to take cover today and take my chances to enjoy the show. The Cows were smarter than me, when they heard the loud thunder they ran down hill to the bottom of the field, you can see them in the image. Compare this with image one on page one. The dynamic range in brightness was awesome for this storm. The core was very bright, storm top dark, and rim dark, but in order to pick up the dark base the other areas had to burned out. When I tried a different setting to get the core darkened down, the other regions were too dark. Very difficult. You will see what I mean when you view the video footage because the auto exposure on my camera's movie mode chose the same setting as I did manually so I probably caught it near as best I could. I seen two c-gs hit the ground at the same time here, one to the S, and the other to the N side of the storm. Some bolts where random but at this stage the majority were hitting the ground to the R (N) near the edge of the rain core. I heard more thunder than bolts, so others must have fired out behind the rain where I could not see them on the S side. 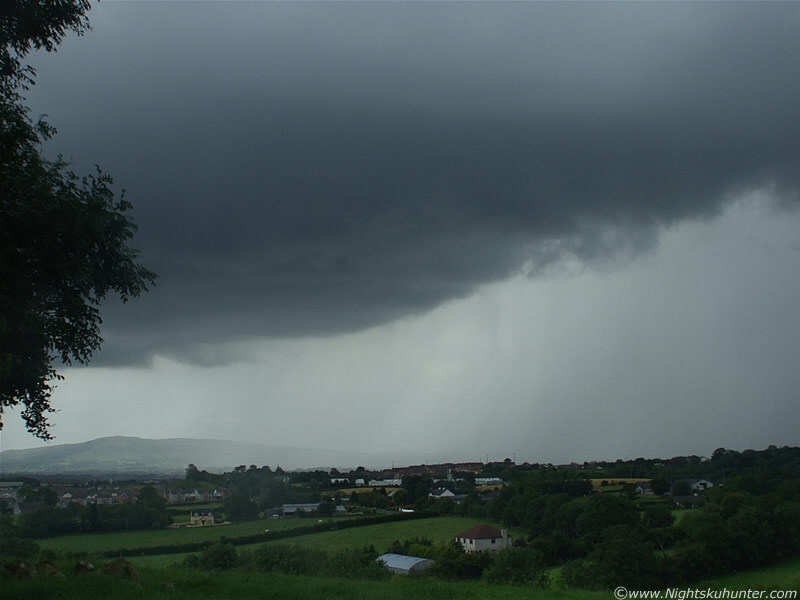 I really like this image because it conveys how dark and nasty looking this storm was. This is more like the naked eye view, both in intensity, size, and distance. 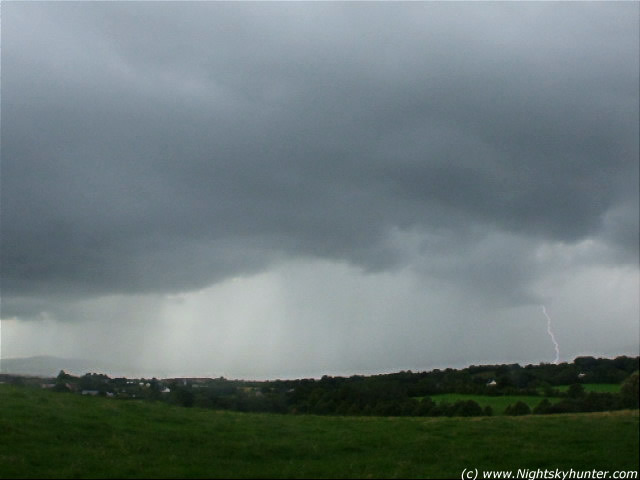 At this stage I was really getting worried because the lightning was fairly close and I was on high ground. I forced myself to stay and take more images. I was hearing thunder alot here so there where more c-g's hitting than I could see. Some in the centre of the image, others to the R, and still a few more further to the R out of frame which seemed to be hitting nearby, behind a tree line. Those sneaked up on me from my blind spot and I got caught off guard. Before this I was getting overconfident but now I was getting anxious. The storm was edging only a little closer to me but at the same time it was creeping further by me to the L. This was a blessing because I was able to watch it from the side the entire time increasing my chances of getting a lightning capture. If I had been at home it would have hit me head-on and things would be difficult because I would actually be INSIDE the rain core trying to take video which wouldn't have been good. Lightning can hit you even if the storm is 10 miles away so this is what made me nervous. From the entire time the storm developed all of the bolts behaved themselves and stayed within the rain core. It was now approaching 17.30 BST. I had been hearing thunder for more than three hours and could see lightning for maybe as much as two hours. I would say as much as 97% of the bolts were c-g's. Another shot which I really like. Two storm precip cores at the same time and both spitting out bolts. One Cow has decided to take a chance and move to higher ground on the R. Maybe he was used to the thunder now. This super wide angle image shows the true size of the storm. Slieve Gallion is the mountain to the L and the buildings in the foreground belong to Maghera itself. I could imagine people in their homes looking out their windows at the dark sky, intense rainfall, and lightning, probably cursing the weather. I was loving it!. I found out later that both my dogs were terrified, I wouldn't blame them. I was switching between stills and video again. Every time I took a video clip nothing would happen so I went back to stills, then a c-g would appear so I would go back to video and catch the thunder. It was really hit and miss to catch one. This was quite a high based storm. 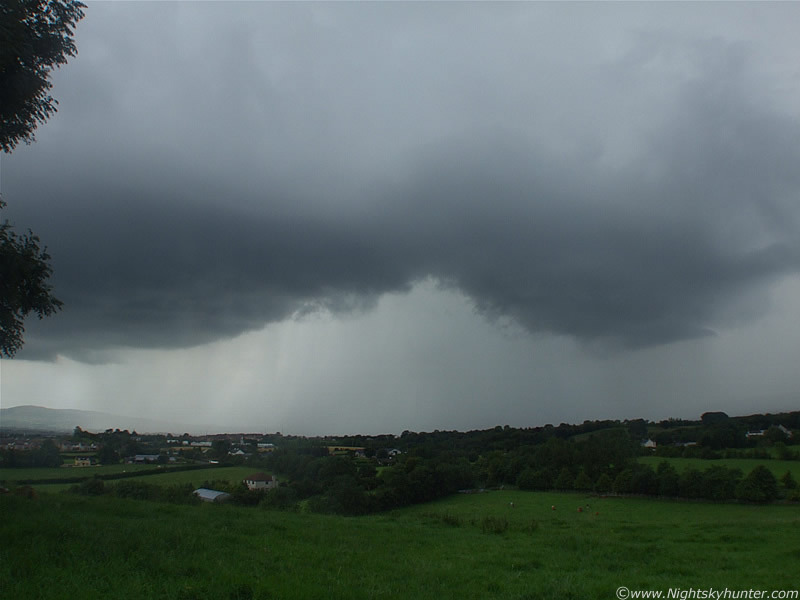 The previous one on August 11th was low to the ground with a cool gust front but this one was quite a tall structure. 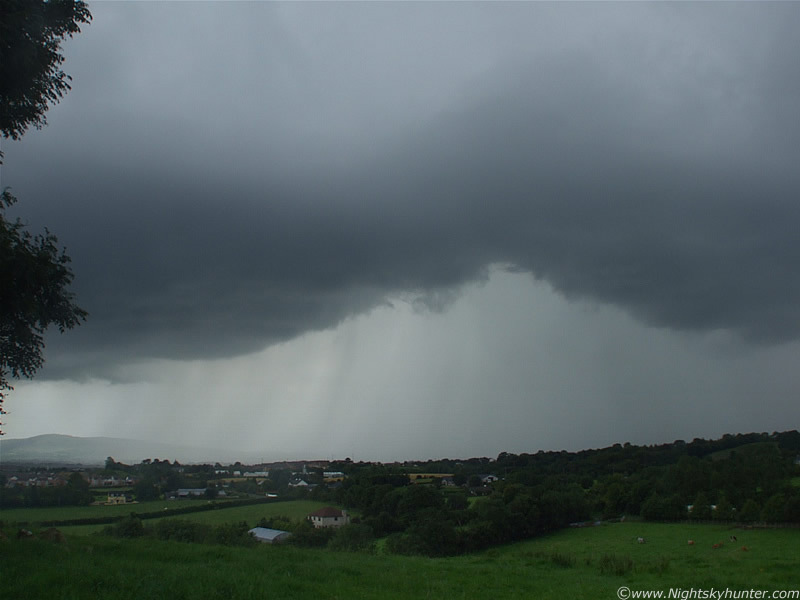 Maybe the Sperrins lifted the storm and it held it's height when it moved over lower ground. 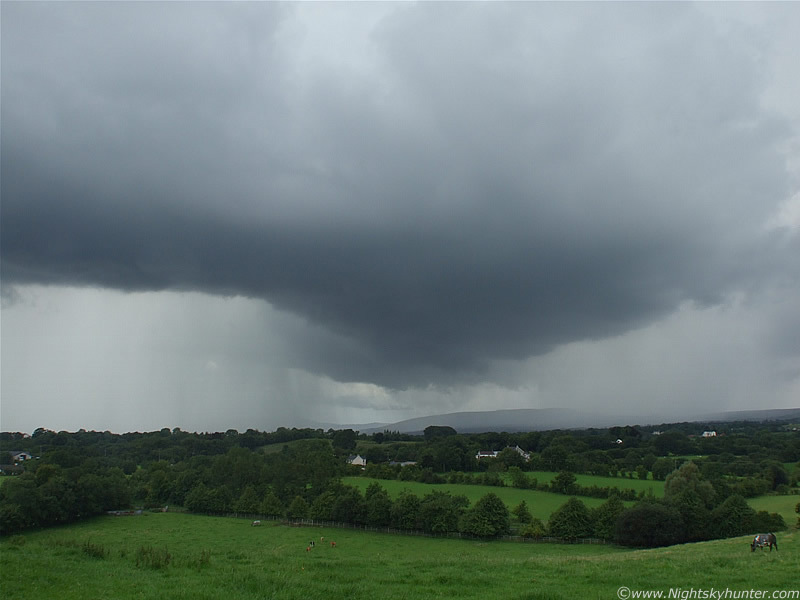 My Aunt lives near Slieve Gallion in the distance, she said the storm didn't hit her, but could clearly be seen over Maghera, she mentioned the 'fork lightning'. 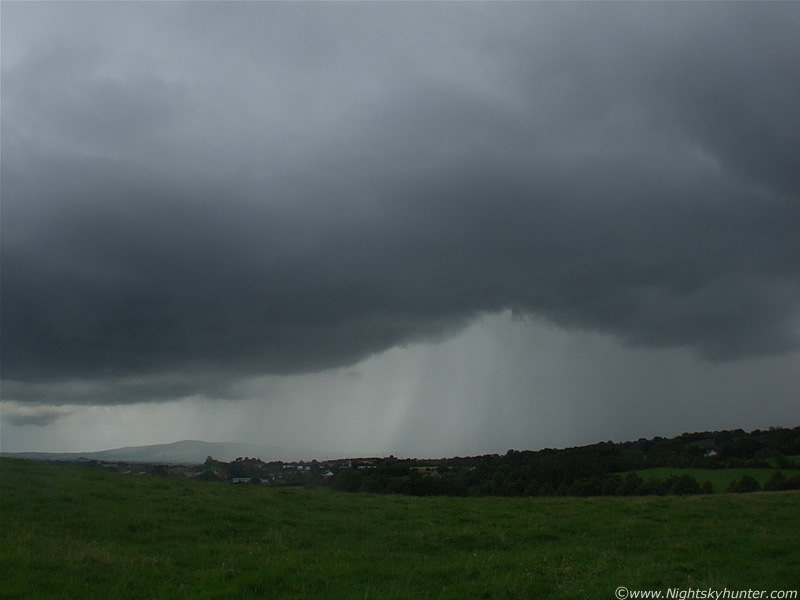 I like this wide angle shot because it shows the entire storm scaled with the town. Looks a bit like Armageddon. All around it the sky was mostly overcast but with no showers so it's amazing how localized these things can be. It's striking to think this storm had been producing intense rainfall for several hours, most of it over the mountains. The storm was at its most violent now and those strikes where pretty close. I moved on down the field to slightly lower ground. My hearts now pumping a bit faster because some of the rain from the edge of the core is hitting me. This was also my most productive period because I managed to catch four c-gs on video before I had to pack up my camera from the rain. I was now in the danger zone and was thinking about cover. Just when the storm reached me it became outflow dominant and stopped producing electrics so someone must have been watching over me. I headed home after this and let the rain do its thing. I have to say that I'm very impressed with my camera, a Fujifilm S6500fd. During the last storm I used it directly under the rain core and it stopped working because of water in the unit. I dried it out for two days and it seemed fine. Apart from a test shot using auto mode in the kitchen before I came out, I didn't know if it would work in the field again. The camera worked flawlessly during the entire storm!. I feel like writing to Fujifim and congratulating them on such a versatile and sturdy camera. I managed to catch four bolts on video. These are the better three which are stills extracted from the clips. 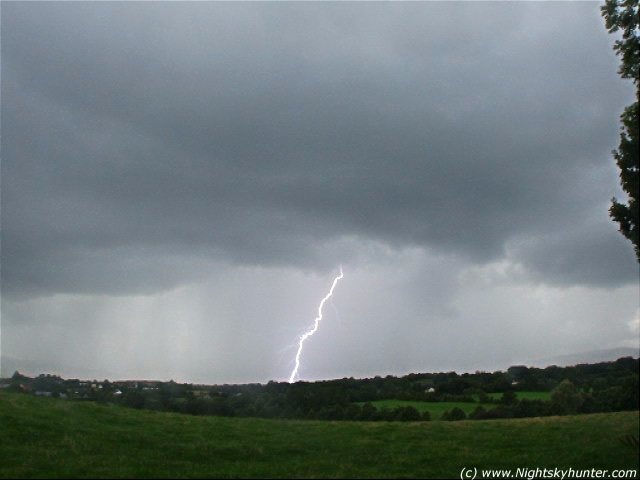 This was my first c-g catch over the mountains to the R. This is the first time I have caught daylight bolts since July 16th 2007. You can tell the distance of a strike by counting the seconds until you hear the thunder. 5 sec's = 1 mile. This one was under 2 miles from me. This was the highlight. A beautiful c-g with many branches dead centre in the frame. The long flat building to the L is St. Patrick's college, the bolt hit somewhere to the R of this in the town. Approx 1 and 3/4 miles from me. Another good capture hitting to the L and behind the college. Over 2 miles from me.